Traditionally WDM systems have been adopted by carriers and service providers. Largescale systems, designed for “national infrastructures” made the systems prohibitively expensive and too complex for private network use. In recent years things have changed. And the technology is evolving rapidly. Today WDM networking solutions are available that meet the needs of corporate enterprises, governmental organizations and privately owned datacenters. Solutions that are simpler and more cost effective than the traditional carrier grade ones. Many organizations have yet to discover the benefits of WDM networking. And how it can be used to help maximize network investments and get the most out of fiber networks. Many organizations have yet to discover the benefits of wavelength division multiplexing, WDM, networking and how it can be used to help maximize network investments and get the most out of fiber networks. The foundation of WDM lies in the ability to send different data types over fiber networks in the form of light. 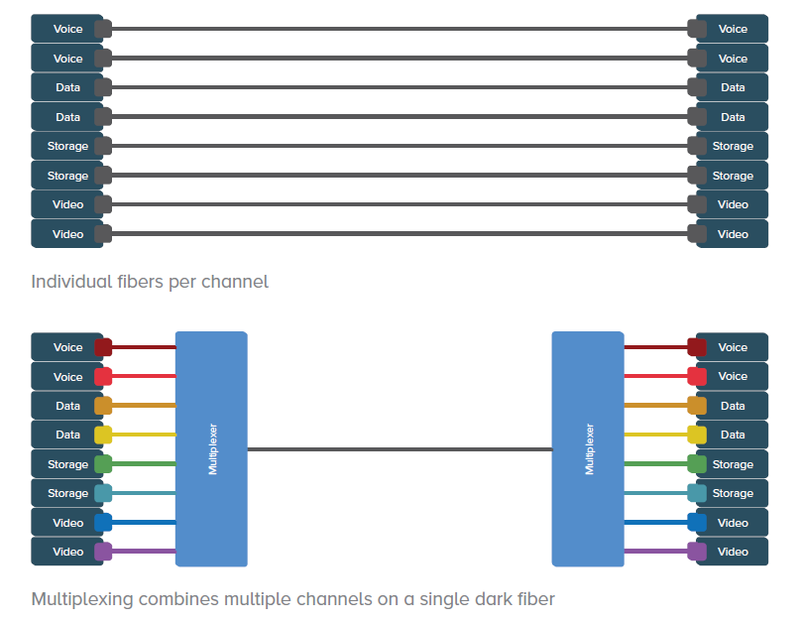 By allowing different light channels, each with a unique wavelength, to be sent simultaneously over an optical fiber network a single virtual fiber network is created. Instead of using multiple fibers for each and every service, a single fiber can be shared for several services. In this way WDM increases the bandwidth and maximizes the usefulness of fiber. Fiber rental or purchase represents a significant share of networking costs. So using an existing fiber to transport multiple traffic channels can generate substantial savings. Transceivers are wavelength-specific lasers that convert data signals from SAN and IP switches to optical signals that can be transmitted into the fiber. Each data stream is converted into a signal with a light wavelength that is a unique color. Due to the physical properties of light, channels cannot interfere with each other. All WDM wavelengths are therefore independent. Creating virtual fiber channels in this way means that the number of fibers required are reduced by the factor of the wavelengths used. It also allows new channels to be connected as needed, without disrupting the existing traffic services. Since each channel is transparent to the speed and type of data, any mix of SAN, WAN, voice and video services can be transported simultaneously over a single fiber or fiberpair. The WDM multiplexer, sometimes referred to as the passive mux, is the key to optimizing, or maximizing, the use of the fiber. The multiplexer is at the heart of the operation, gathering all the data streams together to be transported simultaneously over a single fiber. At the other end of the fiber the streams are demultiplexed, i.e. separated into different channels again. The WDM multiplexer is at the heart of the operation, gathering all data streams together to be transported simultaneously over a single fiber. Early WDM systems were able to transport two bi-directional channels over a pair of fibers. The technology has evolved rapidly and both the number of channels and the amount of data per channel transported has increased. Today up to 80 channels can be simultaneously transmitted down a fiber at any one time. Since they’re usually positioned at the end points in a network, multiplexers are often referred to as terminal muxes. When connecting two sites, a multiplexer is positioned at each site, creating a point-to-point connection. In many cases, networks have additional sites where connectivity is required of some form, but not for all types of traffic. Here optical add drop multiplexers (OADMs) are used to extract the desired wavelengths needed for the specific site while bypassing the traffic types not needed. In this way, more versatile ring, distribution and access networks can be built. The transceiver transmits the high-speed data protocols on narrow band wavelengths while the multiplexer is at the heart of the operation. The patch cable is the glue that joins these two key elements together. LC connector cords are popular, and connect the output of the transceiver to the input on the multiplexer. A re-requisite for any wdm solution is access to a dark fiber network. The most common way of transporting optical traffic over an architecture is by using a fiber pair. One of the fibers is used for transmitting the data and the other is used for receiving the data. This allows the maximum amount of traffic to be transported. At times only a single fiber is available. Because different light colors travel on different wavelengths, a WDM system can be built regardless. One wavelength is used to send data and a second one to receive it.